I had one of those moments people call “none scale victories”. I never thought really truly about those moments, I know that each person experiences a different “ahhh moment”, some are big and some are small. I never paid attention to them before for myself. Last weekend, I was away camping. While out for a morning walk around the park, we came across the kids play ground, which was pretty impressive. I looked at the swing. I stared it down, and was curious, will I fit on this? 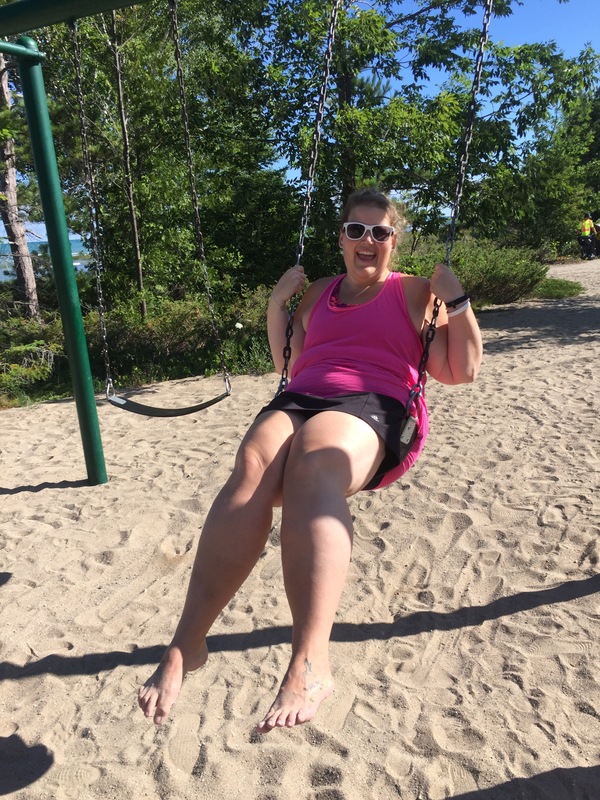 I don’t know if I can properly tell you what it felt like getting on the swing, I didn’t move, I just sat there, my only question was, will it hold my weight? With encouragement, I let my legs leave the ground, I swayed just a little bit as I tested myself. As a plus size person, as much as I love myself, my weight has defined me. I was nervous, I had fear and I was just afraid to start moving. I had to ask Koren, how do I move? The last time I was on a swing was when I was a child, after that, I sidelined myself, even in public school. I went on the swing, I pumped my legs and was going higher and higher, it was that exhilarating moment, when the wind was blowing on me, I was doing this. I was able to wash away the fear that I was going to break the chains, crash down to the sand. Mind you my motion sickness kicked in and well I had to stop. This picture below fully expresses my experience…. To those who have never had to worry about the extra 20lbs, the love handles, the double chin, or even more so, living with fear, you may not understand this, you may not understand a friend when they casually decline to do something. I’m going to tell you, we all live with fear. I lived with fear with my weight, that I would break a swing, which is held on with metal chains. We grow these small fears, which always sit on our minds, whether we are out on a patio, we think, will this chair hold me? Or at an amusement park, will the seat restraint keep me in? My weight has been a chain holding me securely to the earth. It hasn’t allowed me to soar, be free. Each day is a new day with my weight loss, this is not a “diet” or a “fad”, and this is not me just trying to get the summer body (which by now I’m working on 2017 body). This is me choosing to break the chains that hold me down. I don’t want to live with fear. So those of you who have never had to understand, I ask that the next time you are out with friends, don’t look down on them, if they decline, look at the chair they will be sitting in or even something smaller. You don’t know the fear that chains down a plus size person, or even any person at that matter. To those of you who feel like your journey is going to take too long, trust me, it is well worth it. I’ve been on this journey since 2009, I’ve hit slippery patches, I’ve stumbled, but mostly, I never gave up. If you have any amount to lose, just do it for you. For you to look in the mirror love the new you. But always remember if you stumble, tumble, don’t ever stay down. Get up, dust yourself off, and cowboy up. We always fall, it’s life, but it’s how you get back that defines you. So I continue to live it day by day, each day I learn something new. I set goals and crush the hell out of them. I am training for a 15k in September and my first half (which I will finish if I’m crawling up Bay Street in Toronto). I’ve lost over 70lbs so far in 2016 and I’m not done. My friends, don’t ever be afraid to dream and set goals for yourself. The chains you have, they are not you. Chains can be broken with the right will & determination. I met Rachel a couple of weeks ago, at a sample tasting with this product. I never get my daily intake of protein (as I’m sure most of you don’t) So I have a protein shake at some point in the day. Any flavour/brand of any protein powder I’ve ever tried, I never could make with just water. I also had to doctor it up. So really, I was getting protein with a whole lot of extra calories. I don’t want to be depended on my vitamix to make my protein shake to add in fruit, ice, milk, peanut butter etc all to make the protein powder taste better and tolerable. 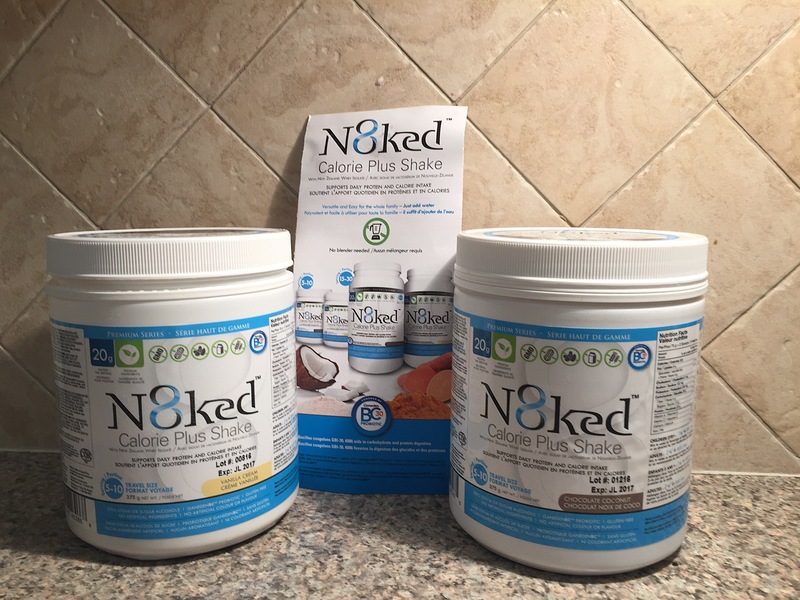 I like N8ked its just grab, shake and go. So back to Rachel, she had me try the Vanilla Creme. I loved the taste immediately. But of course I had a but: I asked what was it mixed with. When she told me Water! I became interested. I started to read labels, I had questions. I wanted to know more. What’s good for me. What’s these extra ingredients. I started to truly compare. 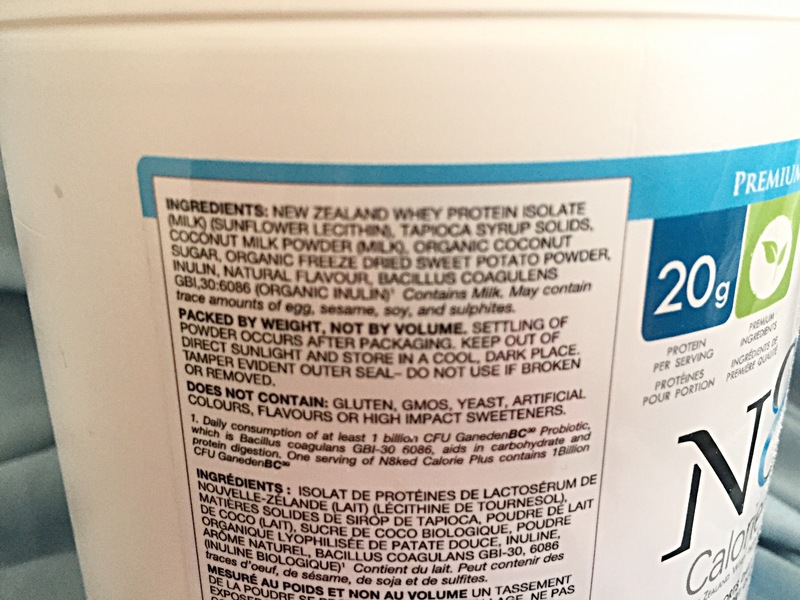 I started to get overwhelmed with the fact half the labels had added ingredients that are not even nutrient related but thickening agents. So it finally made sense that after some shakes I felt beyond bloated and just “heavy”. So I got a crash course on why N8ked is perfect for me. Perfect for anyone from the age of 2+ years. I’m a runner and this is perfect. I got to really thinking, if I’m adding 40grams of protein into my system by liquids, how much is actually being absorbed? How much have I flushed out, just in general body functions. So here is a quick idea of the make and ingredients for N8ked. The product is gluten, GMO, peanut and nut free, lactose free. Contains no artificial ingredients or colour of flavour. It has a probiotic which is awesome. Cause really we all need to be regular. It also contains no stevia or sugar alcohols. So I know I’m getting natural ingredients. I can name them all. I know where they’ve came from. So have you looked at what you are consuming for a protein? Or do you just buy what’s cheap? Do you care what you’re putting into your body? You might think this is just for runners, but the bonus is, even if you’re not, this is a good way to help get protein into your system on those busy days. I know my running family all use protein, my suggestion is go try this protein with water! It has a smooth rich taste. It gives you protein, you know it’s being absorbed to your system. It’s healthy. This product has sold me. I didn’t have any side effects. Got protein into my system. Did not have any bloating, heavy feelings. 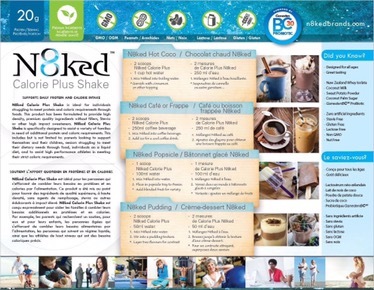 So next time you are out buying protein, look at this product, give it a try for your own body. Start reading labels. It’s not just at the grocery story you need to read labels. This is a Canadian company based out of Toronto. So support local! Thank you Rachel and team N8ked! So here I am; looking for support/sponsors for an upcoming run I am doing. It will be my 2nd 15k that I am going to complete. I have a time in my head, a mental game plan on how I will successfully cross the finish line on September 17th. I’m not asking you to just give the money because this is run is going to be me against my legs, with my heart pushing me. I’m asking you to donate to this, to Sunnybrook Hospital, to support our youth. I’m asking you to donate, to give our youth a fighting chance, between growing up (we all remember those hormones and emotions), dealing with mental health issues and just trying to figure life out in such a short spam in those youth years, we need to make sure they have a safe place to turn for help. To express the feelings, the walls they’ve built up and mostly know it’s ok to admit they need help. We may never end the stigma of speaking up and admitting its ok to need help, but we can give some a fighting chance. I believe in our upcoming youth, which means those of you who are parents, I believe in your children. I believe we have youth walking around that have the ability to go into cancer research, go into engineering (because really before I die, I want to be like the Jetson and fly in my car. ), we set the path for the youth, the next generation, but they still need us. They still need us to create safe places. So I ask, pretty please consider donating, your spare change, the Starbucks/Tim Hortons coffee money. Don’t donate because I am going to run 15k whether I crawl, walk or woggle, I will finish and not disappoint any of you who donate, but donate to give our youth, their families a chance, a place to seek help. This small town girl still believes it takes a village to raise a child….